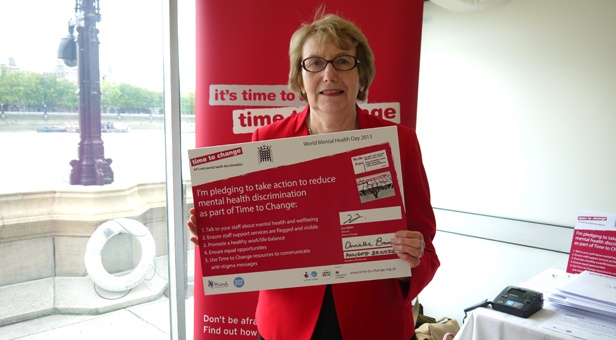 On World Mental Health Day (Thursday 10 October), Annette Brooke, MP for Mid Dorset and North Poole, signed a pledge with Time to Change, the mental health anti-stigma programme The pledge is a commitment by MPs in their roles as small employers to address mental health stigma and discrimination, and support mental health and wellbeing among their staff. The pledge signing took place at an event in Parliament where Annette joined colleagues from across the political spectrum in making a public statement that they will talk to their staff about mental health and wellbeing, ensure support services are flagged, promote a healthy work/life balance, ensure equal opportunities and use Time to Change resources to communicate anti-stigma messages. The event was also an opportunity to celebrate the significant landmarks in the work Parliament has done in the last 18 months to address stigma and discrimination. These include the passing of the Mental Health (Discrimination) Act, which put an end to archaic laws that discriminate against people with mental health problems, and four MPs disclosing their mental health problems in Parliament for the first time ever last year. Some of the most influential figures and organisations in politics and finance have signed the pledge this week including the Bank of England, the Financial Conduct Authority and NHS Employers. They join other major organisations including British Gas, BT, Lloyds Banking Group, Ernst & Young, EON and Pepsico.